I bought Ammon Shea’s book, Reading the OED a couple of weeks ago, but haven’t had a chance to read it yet. It looks pretty good, and is about one man’s experience reading through the OED (Oxford English Dictionary). 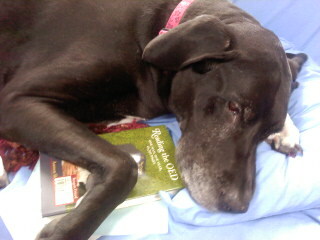 Instead, I found my housemate’s dog curled up with the book and sleeping in the sun. It was too fun not to share! 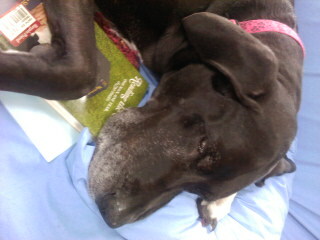 Curled up with "Reading the OED"
She is a beautiful Great Dane, but still loves to curl up with a book occasionally. 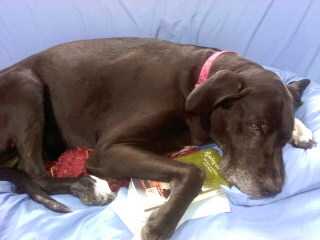 Do your pets ever fall asleep on your books? Hope your Sunday is going well! This entry was posted in Fun, reading and tagged Ammon Shea, big dogs, Dogs, Great Dane, Reading, Reading the OED. ← What is Queer Theory? Maybe the pooch will be like Edgar Cayce, and wake up knowing the book from cover to cover? Our dog does not read, but does watch the TV. I cannot tell you how many times I have had to tell him that standing too close to the TV will ruin his eyes! Now the cats and books are different stories. They have to be right in the middle of whatever it is I am reading! Looks like a comfy bed that the dog has commandeered too! What a life! Yeah! She is pretty cozy 🙂 Cats really do seem to explore the pages pretty frequently I’ve noticed, although I don’t live with one right now. Thanks for sharing! My kitty falls asleep on everything from my jackets to books to paintings that I’m trying to work on RIGHT THEN AND THERE. It’s adorable, although paint and cat fuzz don’t exactly behave well together. Great danes are wonderful dogs! Thanks for sharing! We had three great danes over the course of my teen years…LOVED THEM!! Agreed- They are pretty great!